It’s official, Oliver is officially the worst friend… ever. Oliver screws over Diggle and people die. Oliver almost gets it on with the girl Slade likes. Oliver basically steals away Laurel without trying. Oliver makes Tommy feel very emasculated. On the Bonus side, the sister isn’t nearly as annoying as she used to be and Dresden had a really great moment as well. But yes, Oliver is a worse friend than Bruce Wayne… which is why he’s driving everyone away from him. But you know what, I can’t feel sorry for Oliver at all. Screw him. Make Diggle the star of the show!! And the writers prove they (unfortunately) understand the meaning of irony. That building had nothing but glass windows… and Captain Jack was standing there for like half an hour… so why didn’t Deadshot shoot him? Why didn’t Deadshot go for the head-shot? Why did only the one cop go up to the stairs? Why didn’t she find her way to the penthouse? But before that, why was he having a date on a night he KNOWS something will happen? Seriously, the logistics of this show drives me batty sometimes! Speaking of Bats… towards the end were they channelling Spider-Man ala Green Goblin? Psst, that’s Marvel! 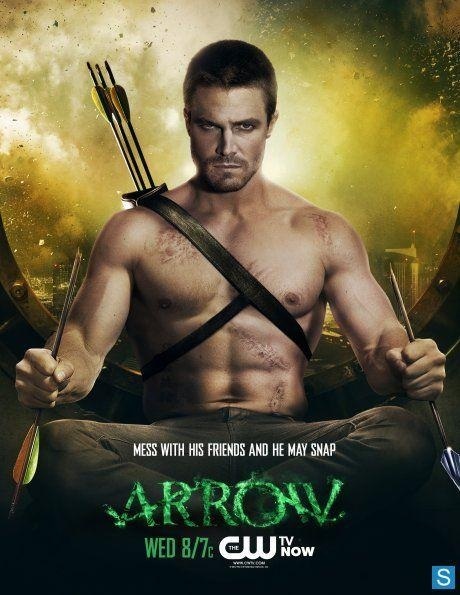 Though I suppose it could be canon to the Green Arrow comics… I can’t be bothered to check it out. I do read DC’s Suicide Squad and Floyd is a much better/complex character in it than in this show. Overall, it was still a better episode than the front end of this season, they toned down the relationship drivel and didn’t do too much with the flashback… but it still wasn’t a good episode by any means. Oh, River Song shows up and says “Hello Laurel”… no “Hello sweetheart”? Arrow. I. Am. Disappoint. TL;DR – Captain Old Spice steals the largest Ring Pop ever and Robin, erm, Speedy, makes his entrance. Seriously, I don’t usually diss on props but that ruby looked like a Ring Pop… like it was candy. It just made me laugh. Moving on, nice to see Captain Old Spice (or Baltar if you must) on the screen again, but much like Crichton, what a waste of the man’s talents. The Dodger must be pretty slick though because how in the world did he get that collar on Felicity without her kicking him or at least screaming, cause I’m pretty sure she could have easily just jumped back and shouted and the jig would have been up. But assuming he is that quick, how did he slip it on and not get it caught in her hair? This episode also sees the introduction of Roy Harper Jr, aka Speedy, though they are probably going to skip the whole Robin-esqe storyline of Roy being adopted by Oliver and jump ahead to Roy being Red Arrow (especially since he was wearing that red hoodie). Not sure how it will play out but we’ll be seeing more of him in the coming episodes. I like how he was snarky with Thea, he didn’t completely win me over but there is promise there. Overall, there was a distinct lack of Thea and whingeing in this episode, always a plus. The constant need to put Oliver into some kind of relationship… thing… has already worn its welcome. The flashback was again a pointless waste of space, okay, so Oliver made a tough choice, thank you, we get that, it’s not like we can’t infer it from the fact he spent five years on the island with a bunch of psychopaths. Still, Felicity has shown herself to be the heart of the group and that made the first half of the episode rather enjoyable. Things are definitely looking up as that’s two episodes in a row that haven’t made me scream WTF or STFU, let’s hope this continues and the quality starts to rise. With China White back in the mix (and with better hair), things should get interesting. “Mess with his friends and he may snap.” Who comes up with this tripe? There was no chance Arrow wasn’t getting a second season as it has been doing great in the ratings… for CW. But it’s been confirmed via Entertainment Weekly that there will indeed be a second season for Arrow. So what does this mean for our hero? Not a whole lot except the promise of getting better. A lot of shows tend to see an upswing of quality in their second season. Budgets tend to get a little bigger. Writers a little riskier. Actors more comfortable. I’ve made no bones in my reviews of this show about how bad it is, the constant speechifying, whining, and complete lack of attention paid to named villains. Correct me if I’m wrong but don’t you need a script first? I mean, I suppose you can work off a teleplay or story treatment (if they even have one)… but we’re talking about the casting and future of a tv show here, not prep for a mid-season episode. They must be very confident in what kind of woman they want as Diana, what type of female fighter she is going to be because there are several different kinds. They must also know what kind of tone they are going for as well, we know it will be more like Arrow in that it will be ‘very realistic’ but that still doesn’t mean it can’t be more light-hearted or darker. Of course, I’m quite new to the idea of creating a television show so this could be a common practice (though I’ve never heard of them doing such a thing and I have always been an avid entertainment news watcher). They could mold the tv show towards the actress which could be a pretty smart move since she’ll have to carry the lead. However this ends up playing out, so far Amazon is not inspiring me with any confidence. Vendetta, or the ‘oh yeah, we’re on the CW’ episode. Seriously, 80% of this episode was relationship drama. ‘Don’t hurt me cause I can’t be hurt anymore’. ‘You still love him/her’. Which wouldn’t have been so bad if the dialogue wasn’t… so bad. Really, if you have to say this stuff bluntly and outloud then you’ve already lost the game. Once again, the only really good stuff is the supporting characters like Digby and the computer tech. I couldn’t give a hoot-n-nanny about Oliver and his ‘I can’t open myself to anyone’ or whatshisface’s ‘I’m broke now and I want to make it on my own’ tripe. The show almost reads like bad fanfic… yes… I went there.